A very simple low cost water level indicator circuit can be designed using this schematic circuit . This water level indicator is based on a simple CMOS IC CD4066 and indicates the amount of water present in the overhead tank and also gives an alarm when the tank is full. 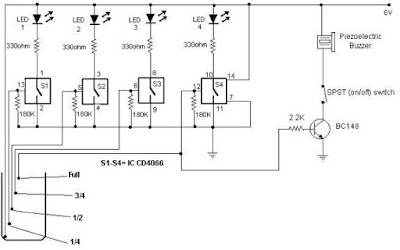 As you can see in the circuit diagram the circuit uses the widely available CD4066, bilateral switch CMOS IC to indicate the water level through LEDs. 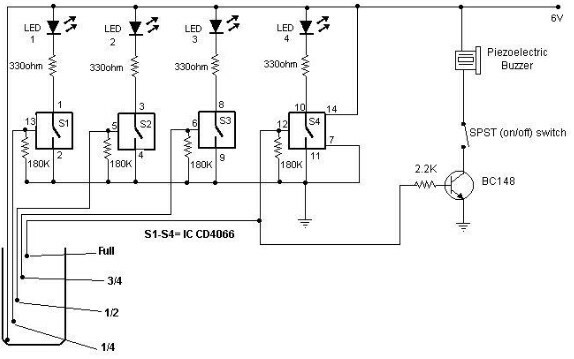 As you can see this electronic liquid sensor circuit require very few external components and need to be powered from a 6 volts DC power supply .